Mr Smith is a Good White Man -- July 13 -- Guests: Howard Jonathan Fredrics and Lori Joachim Fredrics. Jerry Gerber: Patterns. From "Moon Festival". Ottava Records CD 02-006. Mark Applebaum: Tornado Food. From "the apple doesn't fall far from the tree". innova CD 565. Andrew Durkin: Theme from City of Angles. The Industrial Jazz Group. From "City of Angles". innova CD 571. Fully Celebrated Orchestra: Succubusology. From "Marriage of Heaven and Earth". innova CD 567. David S. Ware: Solar Passage. From "Cryptology". Homestead Records CD HMS220-2. John J. A. Jannone: Destiny & Infinity. From "electronic music". Recording provided by the composer. Randy Weston: The Last Day. From "Ancient Future". Mutable Music CD 17508-2. Gary Verkade/Steve Nelson-Raney: Four. From "Improvisations for Organ and Saxophone". Penumbra CD012. David Gunn: Best of the Bazaar, Mark LXXII. Recording provided by the composer. Marc Bjorknas: Anahata Nad (unstruck sound). From "Cache 2001". PeP CD 004. Tom Heasley: Thonis, conclusion. From "On the Sensations of Tone". innova CD 566. Elliott Schwartz: Vienna Dreams. Fibonacci Sequence. From "equinox". New World Records CD 80582-2. Alex Abele: Seven and Unison from Trois Quartet. Vermont Contemporary Music Ensemble. Recording provided by the composer. Lev 'Ljova' Zhurbin: Window Cleaner. Empyreal String Quartet. From "The Big Show", recording provided by the composer. David S. Ware: Pleiades. From "Cryptology". Homestead Records CD HMS220-2. Phil Kline: The Holy City of Ashtabula. From "Glow in the Dark". CRI CD 801. Linda Catlin Smith: Little Vencie, beginning. Arraymusic. From "Chroma". Artifact (Canada) CD ART 004-CD. Linda Catlin Smith: Memory Forms, conclusion. CBC Radio Orchestra. Artifact (Canada) CD AFT 024. Tom Heasley: Montpelier Meditations (complete). Recorded by MaltedMedia at the Ought-One Festival of NonPop. Chas Smith: Aluminum Overcast. From "Aluminum Overcast". Cold Blue CD CB 0007. Laurie Spiegel: A Cosmos from Three Modal Pieces. From "Obsolete Systems". Electronic Music Foundation CD EMF CD 019. Laurie Spiegel: Crying Tone from Four Short Visits to Different Worlds. From "Obsolete Systems". Electronic Music Foundation CD EMF CD 019. Horatiu Radulescu: Inner Time II, excerpt. Armand Angster Clarinet System. Montaigne CD MO 782030. Dennis Báthory-Kitsz: Cutting Ice in January from Stores. Recording provided by the composer. Eliane Radigue: Biogenesis, excerpt. Metamkine CD MKCD 019. Phill Niblock: Five More String Quartets. Soldier String Quartet. From "Music by Phill Niblock". Experimental Intermedia CD XI 111. Dennis Báthory-Kitsz: Telling Stories from Stores. Recording provided by the composer. Laurie Anderson: Here With You. Laurie Anderson, Eric Friedlander, Skúli Sverrisson. From "Life on a String". Nonesuch CD 79539-2. Elliott Schwartz: Chamber Concerto IV. OSU New Music Ensemble, Craig Kirchhoff, conductor, James Hill, saxophone. CRI CD 598. Laurie Anderson: O Superman. From "Big Science". Warner Bros. LP BSK-3674. Laurie Anderson: O Superman. From "Live at Town Hall New York City September 19-20 2001". Nonesuch CD 79681-2. Laurie Anderson: Strange Angels. From "Live at Town Hall New York City September 19-20 2001". Nonesuch CD 79681-2. Laurie Anderson: Monkey's Paw. From "Strange Angels". Warner Bros. CD 25900-2. Laurie Anderson: Sharkey's Night. From "Mister Heartbreak". Warner Bros. LP 25077-1. Laurie Anderson: Sharkey's Day. From "Mister Heartbreak". Warner Bros. LP 25077-1. Laurie Anderson: Statue of Liberty. From "Life on a String". Nonesuch CD 79539-2. William S. Burroughs: Twilight's Last Gleamings. From "You're the Guy I Want to Share My Money With". Giorno Poetry Systems LP GPS 020-021. Laurie Anderson: Life on a String. From "Life on a String". Nonesuch CD 79539-2. David Mooney: Rhymthiconic Sections, #1-11. Arizona University Recordings CD AUR CD 3087. Åke Hodell: Mr Smith in Rhodesia. Recording information to follow. Howard Jonathan Fredrics: Screams from Lima. Recording provided by the composer. Howard Jonathan Fredrics: The Mockingbird. Ed Fitzpatrick, voice; the Sarus Ensemble. Recording provided by the composer. Paul Hindemith: Septet for Wind, I. Deutsche Kammerphilharmonie, Christian Tetzlaff, conductor. Virgin Classics CD 7243 5 45056 2 1. Howard Jonathan Fredrics: Northern Lights. Duo Sonnekus and Friends. Recording provided by the composer. Howard Jonathan Fredrics: Sway With Me. Jennifer Bateman and the Austin Quartet. Recording provided by the composer. Howard Jonathan Fredrics: Grodorna. Lori Joachim Fredrics, voice. Live performance in studio. Howard Jonathan Fredrics: Alwa's Love Theme from Music from Wedekind's Lulu. Recording provided by the composer. Howard Jonathan Fredrics: Dance of Death from Music from Wedekind's Lulu. Recording provided by the composer. Howard Jonathan Fredrics: Fidel, the Communist Pig. The Streepies. Recording provided by the composer with live performance in studio. David S. Ware: Surrendered. From "Surrendered". Columbia CD CSK12619. Barbara Benary, Laura Liben, Daniel Goode, David Simons, David Demnitz: Nine Eleven. Gamelan Son of Lion. Live concert from June 7, 2002. Recording provided by Gamelan Son of Lion. George Lewis: Airplane. Recording provided by the composer. George Lewis: Bridges. Jerome Rotherberg, speaker. From "Changing With the Times". New World Records CD 80434-2. George Lewis: The Lion's Sing. Miya Masaoka, koto. From "The Usual Turmoil". Music and Arts CD 1023. George Lewis: Signifying Riffs. Meridian String Quartet. Recording provided by the composer. George Lewis: Voyager for Seven. From "Audiology: Total Music Meeting 2001". Free Music Production CD ALL 002. Kenneth Gaburo: Exit Music I: The Wasting of Lucrecetzia." From "Tape Play". Pogus CD P21020-2. Claire Laronde: Les Particules de la Perception. From "Electroacoustic Music Vol. VII". ElectroShock Records CD ELCD 026-027. Artemiy Artemiev and Karda Estra: Open Window From "Equilibrium". ElectroShock Records CD ELCD 031. Simons: Cool It Wayang. Gamelan Son of Lion. From "Bending the Gending". Gamelan Son of Lion CD GSOL CD-3. Daniel Goode: Eine Kleine Gamelan Music. From "Bending the Gending". Gamelan Son of Lion CD GSOL CD-3. Eve Beglarian and Phil Kline: Songs from the Bilitis Project. With Margaret Lancaster and Eleanor Sandresky. Recorded by MaltedMedia at the Ought-One Festival of NonPop. Eric Chesalow: Suspicious Motives. Auros Group for New Music. From "Music From SEAMUS 11". SEAMUS CD EAM-2002. Rhys Chatham: An Angel Moves Too Fast to See. From "A Rhys Chatham Compendium". Table of the Elements CD TOE-CD-56. Alvin Lucier: Still Lives, #I and #VII. Joseph Kubera, piano. From "Still Lives". Lovely Music CD LCD 5012. Antanas Jasenka: Acoustics. From "Deusexmachina". ElectroShock Records CD ELCD 025. Thuunderboy: Wait a Second. From "Thuunderboy". Table of the Elements CD TOE-CD-76. Robert La Pat: Athletic Overture. Recording provided by the composer. Edward Artemiev: Appeal. From "Three Odes". ElectroShock Records CD ELCD 030. Mark Gustavson: Hymn to the Vanished. String Orchestra of New York City. Recording provided by the composer. Kyle Gann: Custer and Sitting Bull, I: Custer: "If I Were an Indian...". From "Custer's Ghost". monroe street CD msm 60104. Kyle Gann: Custer and Sitting Bull, II: Sitting Bull: "Do You Know Who I Am?". Recorded by MaltedMedia at the Ought-One Festival of NonPop. Kyle Gann: Custer and Sitting Bull, III: Sun Dance / Battle of the Greasy Grass River. Recorded by MaltedMedia at the Ought-One Festival of NonPop. Kyle Gann: Custer and Sitting Bull, IV: Custer's Ghost to Sitting Bull. Recorded by MaltedMedia at the Ought-One Festival of NonPop. Kyle Gann: Snake Dance No. 2. Essential Music. From "ten years of essential music". monroe street CD msm 60101. Kyle Gann: Desert Sonata, II: Night. Lois Svard, piano. From "Other Places". Lovely Music CD LCD 3052. Kyle Gann: Superparticular Woman (Tuning Study No. 1). From "Custer's Ghost". monroe street CD msm 60104. Kyle Gann: Fractured Paradise (Tuning Study No. 3). From "Custer's Ghost". monroe street CD msm 60104. Robert D. Polansky: Echo Bridge. Margaret Lancaster, flute. Recording provided by the composer. David Rakowski: BAM!. Theresa McCollough, piano. From "New American Piano Music". innova CD 552. David Rakowski: Nocturnal. Theresa McCollough, piano. From "New American Piano Music". innova CD 552. David Rakowski: Close Enough for Jazz. Theresa McCollough, piano. From "New American Piano Music". innova CD 552. Elizabeth Pizer: Bittersweet. From "Strains and Restraints". Theresa McCollough, piano. From "New American Piano Music". innova CD 552. Elizabeth Pizer: Ethereal/Melancholy. From "Strains and Restraints". Theresa McCollough, piano. From "New American Piano Music". innova CD 552. Elizabeth Pizer: Playful/With Innoncence/Gentle. From "Strains and Restraints". Theresa McCollough, piano. From "New American Piano Music". innova CD 552. Randall Woolf: allemande. From "dancétudes". Kathleen Supové, piano. From "figure 88". CRI CD 653. Randall Woolf: courante. From "dancétudes". Kathleen Supové, piano. From "figure 88". CRI CD 653. Randall Woolf: sarabande. From "dancétudes". Kathleen Supové, piano. From "figure 88". CRI CD 653. Randall Woolf: rag. From "dancétudes". Kathleen Supové, piano. From "figure 88". CRI CD 653. Randall Woolf: shuffle. From "dancétudes". Kathleen Supové, piano. From "figure 88". CRI CD 653. Eleanor Sandresky: A Sleeper's Notebook. Recorded by MaltedMedia at the Ought-One Festival of NonPop. Stephen Jaffe: Impromptu. Patricia Goodson, piano. From "Strange Attractors". Albany CD Troy 231. John Adams: China Gates. Jenny Lin, piano. From "Chinoiserie". BIS CD 1110. Drew Krause: Andante con moto. From "Three Intermezzi". Jeffrey Jacob, piano. From "Contemporary American Eclectic Music for the Piano,", volume 3. New Ariel CD AE 003. Drew Krause: Presto. From "Three Intermezzi". Jeffrey Jacob, piano. From "Contemporary American Eclectic Music for the Piano,", volume 3. New Ariel CD AE 003. Drew Krause: Grazioso. From "Three Intermezzi". Jeffrey Jacob, piano. From "Contemporary American Eclectic Music for the Piano,", volume 3. New Ariel CD AE 003. Toru Takemitsu: Les yeux clos. Christina Petrowska, piano. From "Mystic Streams". Welspringe Productions CD WEL001. Arthur Jarvinen: The Meaning of the Treat. Vicki Ray, piano. From "from the left edge". CRI CD 830. Gregory Boardman: Monolog.3. Corey Jane Holt, piano. From "Bonk Festival of New Music 2002". BONK CD BFM-091. Alexina Louie: Star Filled Night. Christina Petroska, piano. From "Virtuoso Piano Music of Our Own Time". JLH Lasersound CD JLH 1002. Paul Marquardt: Test Pattern. Drew Krause and Paul Marquardt, pianos. From "THUMPMUSIC". Frog Peak Music CD FP003. Daniel Lentz: O-Ke-Wa. From "Missa Umbrarum". New Albion LP NA006. James Tenney: Blue Suede. From "Selected Works 1961-1969". Frog Peak Music CD 001. Mr. Meridies: Carpet Tunnel Syndrome. From "Deconstructing Beck". illegal art CD 001. Jane Dowe: Puzzels & Pagans. From "Deconstructing Beck". illegal art CD 001. Spacklequeen: Eggs eggs, arms legs. From "Deconstructing Beck". illegal art CD 001. David Gunn: The Help Me Rondo. Vermont Contemporary Music Ensemble. From upcoming CD "Somewhere East of Topeka". Recording provided by the composer. Nick Didkovsky: We'll Ask the Questions Around Here, Part 1. From "Binky Boy". Punos Music CD PM0003. Nick Didkovsky: Egil the Skald. From "Binky Boy". Punos Music CD PM0003. Nick Didkovsky: We'll Ask the Questions Around Here, Part 2. From "Binky Boy". Punos Music CD PM0003. Scott Johnson: John Somebody, Part 1. Nonesuch/Icon CD 9 79133-2. N.N. und Ähnliche Elemente: Fun: It is Serious; Serious: It is Fun. No Edition CD57. Dennis Báthory-Kitsz: "on nix rest in china", Construction for Trombones & Tape. New remix provided by the composer. Nick Didkovsky: Ereia, third movement. Sirius String Quartet & Dr. Nerve. Cuneiform CD rune 126. Violeta Dinescu: Euraculos II. Sandra Craciun, viola; Aurelian Octav Popa, clarinet. From "Romania Today". ProViva CD ISPV 180 CD. Elliott Schwartz: Four Maine Haiku. Elliott Schwartz, piano. From "Dream Music: Chamber Works of Elliot Schwartz". Capstone CD CPS-8633. Elliott Schwartz: Chamber Concerto II. Paul Martin Zonn, clarinet; University of Illinois Contemporary Chamber Players, Edwin London, director. From "Elliott Schwartz: Chamber Works". CRI CD 598. Elliott Schwartz: Equinox. From "Equinox". New World Records CD 80582-2. David Gunn: Best of the Bazaar Mark LXXIII. Recording provided by the composer. Boudewijn Buckinx: Klaviertrio Nr. 1 From "Solisten im Trio". Extraplatte CD EX 408-2. Steven Holochwost: Two Waltzes I. Recording provided by the composer. Steven Holochwost: Two Waltzes II. Recording provided by the composer. Anthony Joseph Lanman: Study No. 1 for Guitar. mp3.com CD 184331. Anthony Joseph Lanman: Study No. 3 for Guitar. mp3.com CD 184331. Carya Amara: I Was a Lad. Recording provided by the composer. Iannis Xenakis: Plekto. NonSequitur. Recorded by MaltedMedia at the Ought-One Festival of NonPop. Eric Lyon: New World Sonatina. NonSequitur. Recorded by MaltedMedia at the Ought-One Festival of NonPop. Theirry de Mey: Musique de Tables. Recorded by MaltedMedia at the Ought-One Festival of NonPop. Clarence Barlow: Le Cixeau de Tom Johnson. Recorded by MaltedMedia at the Ought-One Festival of NonPop. Clarence Barlow: Canonzetta. Recorded by MaltedMedia at the Ought-One Festival of NonPop. Ned McGowan: Tusk. Recorded by MaltedMedia at the Ought-One Festival of NonPop. Charles Mingus: Ah Um. Recorded by MaltedMedia at the Ought-One Festival of NonPop. Juliet Kiri Palmer: W is for. MusicWorks CD 83.
sylvi macCormac: penny: a process. From "Presence III". CEC CD PeP005. Loons in the Monastery: Dissonance is Gliss. From "Stranger than Truth". Sonotrope CD SR009-2. The Industrial Jazz Group: Theme from City of Angles. From "City of Angles" innova CD 571. The Industrial Jazz Group: Anger Management Classes. From "City of Angles" innova CD 571. Steve Layton: String Sextet, first movement. Recording provided by the composer. David Dunn: Ennoia 2. From "Four Electroacoustic Compositions". Pogus CD P21026-2. Brian Reinbolt: Monoid. From "SIBOSOP Volume 1.0". Recording provided by the composer. Scott Smallwood: trojan chant. From "Desert WInds: Six Windblown Sound Pieces". Deep Listening CD DL 17-2002 CD. John McGuire: a cappella. From "pulse music". Sargasso CD scd 48043. Maria de Alvear: Laub. From "Baum". World Edition CD 0006. Maria de Alvear: Stein. From "Baum". World Edition CD 0006. Gary Verkade & Steve Nelson-Raney: Seven. From "Improvisations for Organ and Saxophone". Penumbra CD 012. Tung-Lung Lin: Mirror of Time. From "Presence III". CEC CD PeP005. Barbara Benary: Lelambatan Meows. Gamelan Son of Lion. From "Bending the Gending". Gamelan Son of Lion CD GSOL CD-3. Just John: Tryx. From "Ayatollah of Understatement". Ampcast CD 0203001016. John Cale: Dying on the Vine. Arrangement by David Dramm; David Dramm from "Amsterdramm". Recorded by Malted/Media. Minotto: Holy War in Your Pants. Prime Time Sublime. Richard De Costa: Elegy. Recording provided by the composer for the K&D 9/11 Tragedy Page. Chad Mairn: In Tenebrus Lux. Recording provided by the composer for the K&D 9/11 Tragedy Page. Steve Layton: Each One. 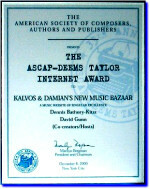 Recording provided by the composer for the K&D 9/11 Tragedy Page. Misha Stefanus: New York Will Go On. Recording provided by the composer for the K&D 9/11 Tragedy Page. David W. Fenton: Elegy. Recording provided by the composer for the K&D 9/11 Tragedy Page. Mark Gustavson: Hymn to the Vanished. Recording provided by the composer for the K&D 9/11 Tragedy Page. Clay La Hatte: Requiem. Recording provided by the composer for the K&D 9/11 Tragedy Page. Gamelan Son of Lion: Nine Eleven. Recording provided by the composer for the K&D 9/11 Tragedy Page. John Oliver: Give Us Peace. Recording provided by the composer for the K&D 9/11 Tragedy Page. Tim Conrardy: Metal Bird. Recording provided by the composer for the K&D 9/11 Tragedy Page. Mary Lou Newmark: A Walk Through the Valley. Recording provided by the composer for the K&D 9/11 Tragedy Page. Lev Zhurbin: Outside. Recording provided by the composer for the K&D 9/11 Tragedy Page. Elodie Lauten: SOSWTC, #16. Recording provided by the composer for the K&D 9/11 Tragedy Page. Phil Jackson: Taledamned. Recording provided by the composer for the K&D 9/11 Tragedy Page. Eve Beglarian: Five Things. Recording provided by the composer for the K&D 9/11 Tragedy Page. Meira Warschauer: In Memoriam. Recording provided by the composer for the K&D 9/11 Tragedy Page. Martin Schiff: 911 Elegy. Recording provided by the composer for the K&D 9/11 Tragedy Page. David Gunn: Best of the Bazaar, Mark LXXIV. Recording provided by the composer. Erika Jürgens: Autoradio e.V. & Hearing Aid Society und Andere Melomanen, Teil 1. No Edition CD 56. Erika Jürgens: Zyklitis, Playthings, Galimathias and a Far-Finishing Tape, from Top 12 Charts of Prenatal Music. No Edition CD 59. Erika Jürgens: Papillon, Sandpit, Hydrophthalamus and a Nice Gesture, from Top 12 Charts of Prenatal Music. No Edition CD 59. N.N. und Ähnliche Elemente: Didsch Mer - Lied im Freien Nordosterländisch Nach der Vorgabe von Rotter, Markush und Parish, Vorgeformt von Lester Polfus Nebst Gattin Iris, Vollendet im Sinne der Unsichtbarkeit von Iris' Schwester, from Auferstrehung der Begrabenen Hunde under-cover-versions in quotation-marks. No Edition CD 55. Erika Jürgens: Fitness for Beginners, from made for ............ No Editon CD 63. Erik Mälzner: MAG.OBJ.NR. 1 - 1972 (Johann S. & Johann S.), from MAG: 19669 Objects. No Edition CD 62. Erik Mälzner: Eleven People in Einer Romantsichen Landscaft, part 18. No Edition CD 58. N.N. und Ähnliche Elemente: Florilegium Rhapsodie, beginning. No Edition CD 60. N.N. und Ähnliche Elemente: Serious: It is Fun; Fun: It is Serious, #20. No Editon CD 57. N.N. und Ähnliche Elemente: Holiday Cottages 0- The Boys Jenja and Yannic - Scientific Reports - A Bunch of Keys - The Young Landy in a Bergmann - And Brazen Lies - Go - Round (Dizzy Turn Rhapsody), conclusion. Ulrike Dommer & Firemoon Five. No Editon CD 61. Robert HP Platz: Requiem (Hörspiel-Montage). Wergo CD WER 6521-2. Georg Bönn: The Barbed-Wire Piano. Ensemble Wireworks. From "Mystik". Recording provided by the ensemble. Georg Hajdu: Klangmoraste. Symphonieorchester der Stadt Guanajuato, Mexiko. Recording provided by the composer. Manfred Stanke: Malaita. Jennifer Hymer, piano. From "Jennifer Hymer Performs Live". Recording provided by the performer. Karlheinz Essl: fLOW, conclusion. Special mix created for the The Ought-One Festival.